New England Horror Writer member Danielle Gelehrter a.k.a TV horror hostess Penny Dreadful has been approached by Comic Book Divas, an indie comic book company about doing a Penny Dreadful comic. It will be an EC-style horror anthology called Penny Dreadful’s Cauldron of Terror. Gelehrter will be writing both the hosting wraparounds and the story themselves. For right now, the comicbook will be a one-shot, but could turn into a series if there is enough interest. NEHW member Nathan Wrann will be screening his film, Burning Inside, at the Somerville Theater on Wednesday, Jan. 5. The film is part of the theater’s monthly screening series, All Things Horror Presents. The Somerville Theater is located at 55 Davis Square in Somerville, MA. For more information about the theater, check out the venue’s website, www.somervilletheatreonline.com. Burning Inside is an exploration of the intertwined nature of revenge and memory. Burning Inside is the second feature from Wrann and his production company, Dalton Gang Productions. 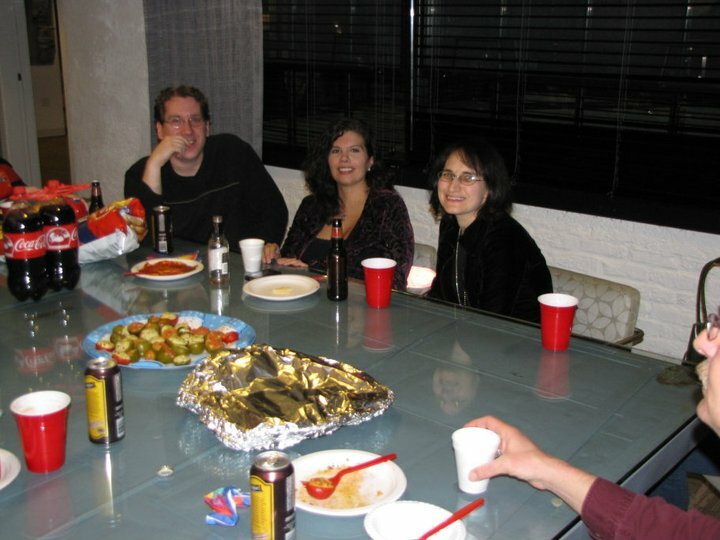 The production company was founded in 2006 by Wrann and his wife, Kimberly Dalton. They started the production company because they were dissatisfied with the caliber of modern independent horror movies and cult thrillers. They set out to create the kind of underground movies they would like to see. They want those movies to be literate and thought provoking in plot, brutal and unrelenting in tension. Wrann is an independent filmmaker out of West Haven, Connecticut. He shot the film entirely in Connecticut. For more information about Wrann and his production company, check out the website www.daltongang-productions.com. NEHW member Tracy Carbone will be appearing at the Borders in Mansfield, MA. 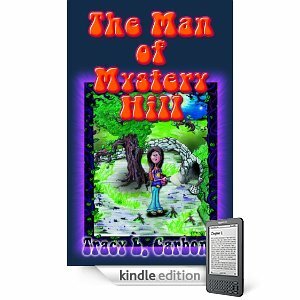 to promote her book, The Man of Mystery Hill. She will be there from 12 p.m. to 3 p.m. The bookstore is located at 280 School Street. Shadows Over New England, a book by authors (and brothers) David Goudsward and Scott T. Goudsward, came out as an ebook in September. This book is a non-fiction guide to horror set in New England. it includes novels, short stories, movies, filming locations and points of interest around the region for horror afficionados. The book covers the six states and follows histories, legends, and fiction dating back from the Salem Witch Hysteria to late 2007. The book is full of information and rarities, but isn’t meant to be comprehensive or a travel guide.information and rarities. 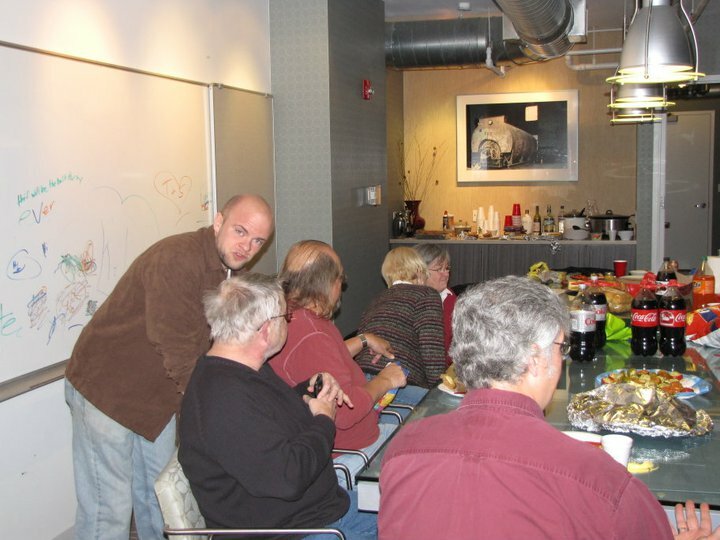 Scott is a member of the New England Horror Writers. 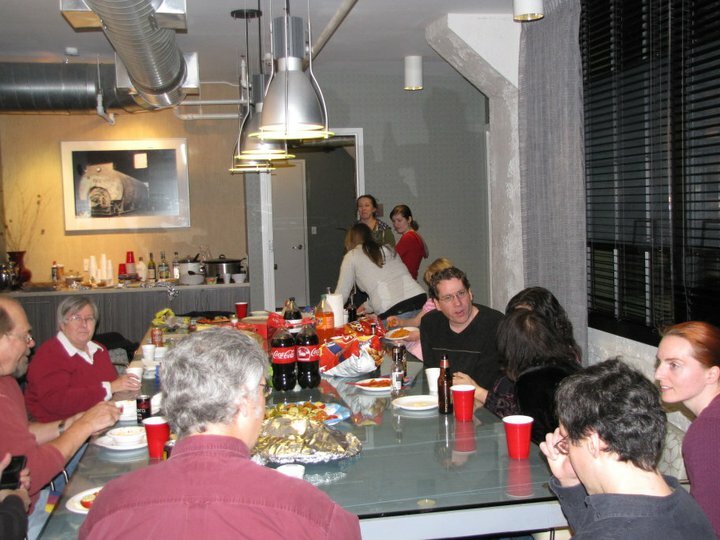 These photos come courtesy of John M. McIlveen, who hosted the party. Here are some works written by NEHW members that would be great Christmas gifts or stocking stuffers. Kurt Newton’s new collection of twisted poetry, The Ultimate perVERSEities from Naked Snake Press (www.nakedsnakepress.blogspot.com) features the art of Christopher Friend. The collection collects old and new perVERSEities into a cannibalistic melting pot of the maniacal and the macabre. Twenty new poems join the original cast of forty that comprised the twin chapbooks published by Naked Snake Press in 2004. For those familiar with Newton’s twisted oeuvre, he has added phantom marionettes, balloon clowns and mail order brides to his list of untapped taboos. And for those unfamiliar with Newton’s unsettling blend of darkness and the bizarre, you are in for the ultimate treat. The Ultimate perVERSEities paperback is available through the publisher’s website and on Amazon. There is also an ebook available at Amazon and at Smashwords (www.smashwords.com/profile/view/nakedsnakepress). Newton also has a novella, Breaking Eggs, which he wrote with L.L. Soares. It is available from Sideshow Press (www.horror-mall.com/BREAKING-EGGS-by-Kurt-Newton-L.L.-Soares-signed-trade-paperback-edition-p-21462.html). Stacey Longo has two stories, “Trojan Horse” and “Turnabout”, in Pill Hill Press’s new anthology Daily Bites of Flesh 2011: 365 Days of Flash Fiction. The anthology is available from the publisher at www.pillhillpress.com. Kristi Petersen Schoonover has a new Christmas horror story, “Jingle Shells,” available at Full of Crow (www.fullofcrow.com/fiction/2010/10/schoonover/). 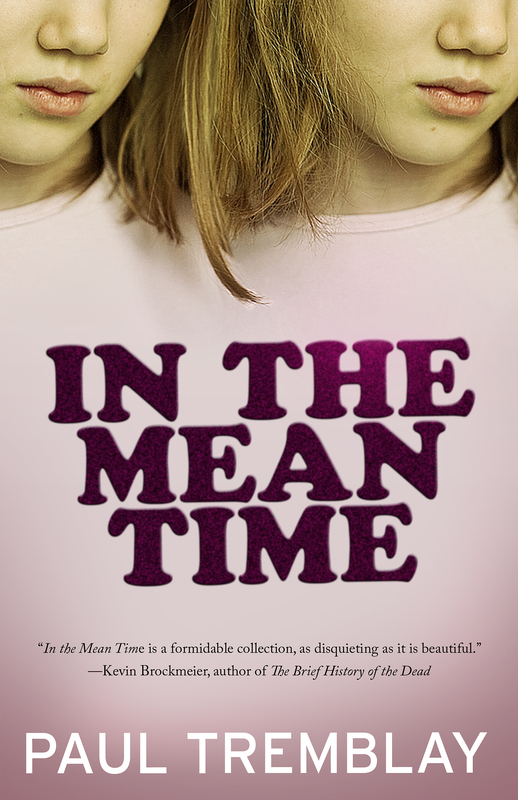 Paul Tremblay has a short story collection, In the Mean Time published by Chizine Publications (http://chizine.com/chizinepub/books/in-the-mean-time.php). Soares and Laura Cooney’s short story collection, In Sickness: Stories from a very Dark Place is available from Skullvines Press (http://skullvines.com). It’s a short story collection where these writers guide you through the regions of the horrific and the surreal. The book is available in print through Amazon and Barnes and Noble.com. It is also available as an ebook. 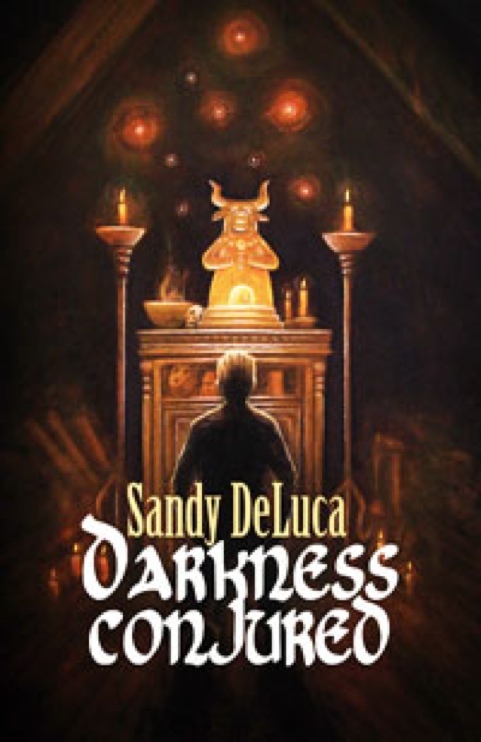 NEHW member Sandy DeLuca’s new novella, Darkness Conjured, is available to preorder at the Horror Mall, www.horror-mall.com/DARKNESS-CONJURED-by-Sandy-DeLuca-Limited-HC-p-21437.html. NEHW member Paul Tremblay’s short story collection, In the Mean Time is up for “Best Dark Genre Fiction Collection” at Dark Scribe Magazine (http://www.darkscribemagazine.com/reader-voting-ballot/). Tremblay’s story collection was published by Chizine Publications (http://chizine.com/chizinepub/books/in-the-mean-time.php). For more information about Tremblay, check out his website, http://www.paulgtremblay.com.